Peterborough United manager Graham Westely insists Saturday (October 31) is the perfect time to play Coventry City. Posh travel to the Ricoh Arena to face the high-flying Sky Blues on the back of their best display of the season, a 4-0 thumping of Darren Ferguson’s Doncaster Rovers at the ABAX Stadium last Saturday (October 24). Westley believes Coventry, who are currently fourth in the table, have a great chance of success this season and he’s a big fan of their manager Tony Mowbray. Coventry have lost just three of their 14 matches and they are unbeaten at their Ricoh Arena base. None of that bothers Westley who is oozing confidence after last weekend’s stunning performance. “Coventry away is a fabulous fixture for us right now,” Westley stated. “Don’t get me wrong Coventry are a very good side and they will be well-organised and well-managed. “They have been playing well and been near the top of the table for most of the season. “But this is the best time for us to play them. “If you could pick a time to go to Coventry it would be after you’d delivered a performance like we did last Saturday. “Obviously it will still be a tough test, but we are all looking forward to it and I suspect our fans will be the same. “It’s a great stadium to visit and we should have a big away following. It’s the perfect test for us to see how far we have come in recent weeks. “We will certainly be in a good frame of mind. We will be positive and we will take the game to Coventry. Posh have beaten only Millwall of the teams currently in the top half of League One. 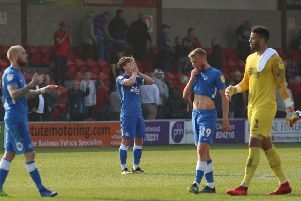 Posh have drawn with top two Gillingham and Walsall, but have lost to Burton (thirrd), Wigan (fifth), Sheffield United (sixth), Bury (seventh), Southend (eighth) and Rochdale (twelfth). Millwall’s 2-0 win against Doncaster on Tuesday (October 27) dropped Posh a place to 10th. Posh are still 8/1 to win promotion from League One with Football League sponsors Sky Bet and just 11/4 to finish in the top six. Posh have an extra injury doubt ahead of the Coventry match as central defender Gaby Zakuani suffered a suspected hamstring strain in the 4-0 win over Doncaster. Midfielder Chris Forrester should be okay after suffering a mild concussion in the same game. Zakuani was playing his seventh match in 21 days having respresented DR Congo in two international matches in October. Westley added: “Gaby is a strong man, but he’s had a very busy period and his body probably gave up on him a bit.